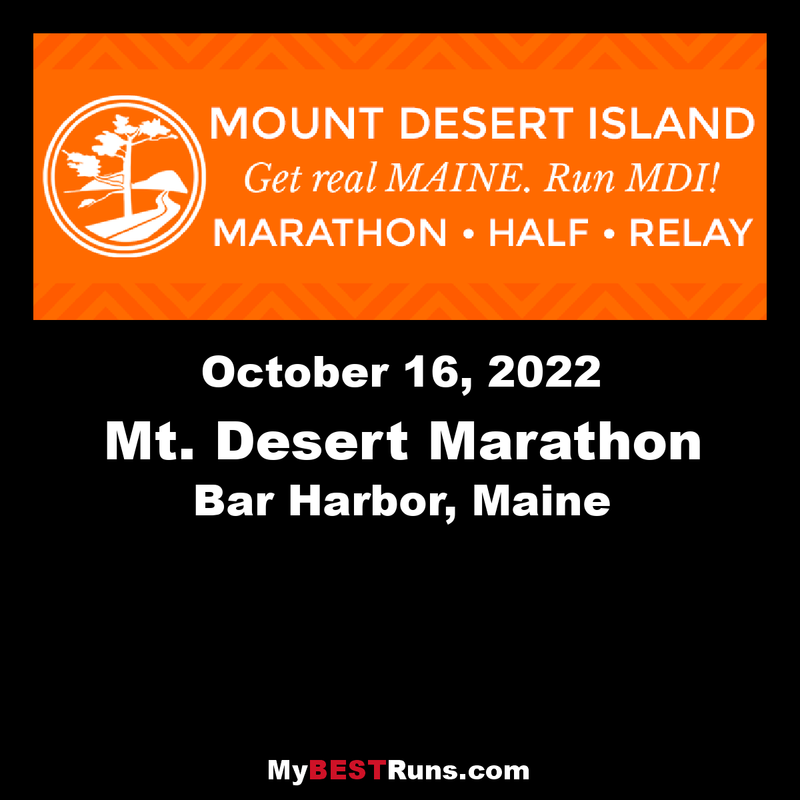 Our 26.2-mile foot race begins in downtown Bar Harbor, where the first mile out is slightly downhill, which will allow runners to warm up before the first hill; a 150-foot climb from mile one to mile three. This incline will carry runners over the ridge between Champlain and Dorr Mountains. Cadillac Mountain, the highest point on the immediate Atlantic Coast at 1,532 feet, will cast its shadow on the early miles of the course. Route 3 then gives back a downhill sweep from miles three to six in the village of Otter Creek, where runners meet the sea and those famous ragged cliffs & headlands at the southeast tip of the Island. The small hill from mile six to seven will not be noticeable because runners will enjoy spectacular scenery along the Hunters Beach Trail. The halfway point is also near the mouth of the only true fjord on the Atlantic Coast, lined with the pink granite that makes up most of the area, Somes Sound nearly bisects the entire Island. The second half of the race is literally on the edge of this remarkable topographical marvel. The low point on the course, will come at mile 16 along the eastern shore of Somes Sound. This is followed by a slight rise to mile 17, and then a sharp incline from 17 to 18, heading up to the cliffs of the interior end of the fjord. Running hills makes for powerful camaraderie. Mile 19 is a giveback downhill, and then the gradual ascent from mile 20 to 25 begins in Somesville, the quintessential New England village. Mile 25 will be the high point of the course, literally and figuratively, and affording great views. And it will be all downhill from there. The final 1.2 miles to the finish line in charming Southwest Harbor descends; yes, that last 2,000 meters will be all down. But what a sky-high feeling of accomplishment it will bring! There is a barbeque at the end of the race, plenty of food, and even showers (though I didn't make use of them so I don't know what they were like). Afterwards, runners wore their finisher medals in Bar Harbor and it was great fun to bond with the other runners at dinner time. "2015 Race of the Year!" "Best Marathon in the Northeast!" to feel good about yourself"
"One of the best marathons anywhere! 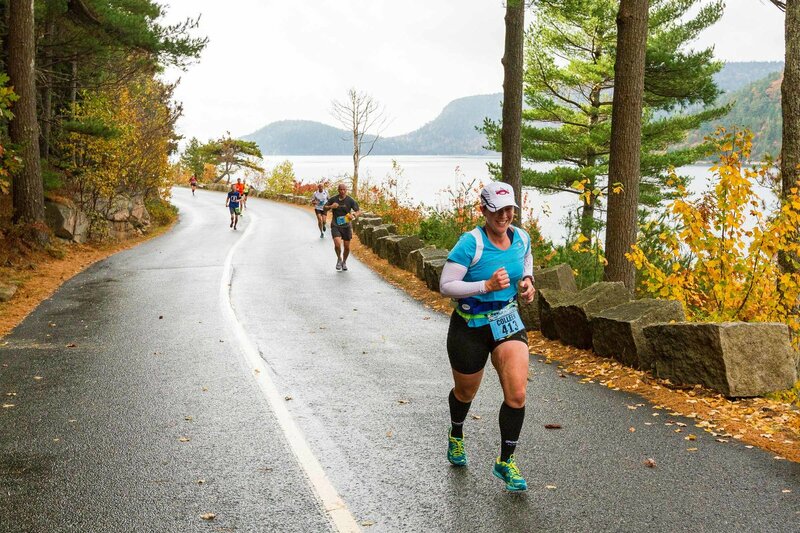 "One of the Best Destination Marathons!" "One of 11 Races to Run Before you Die!" "America's best little road race!"